THE PILOT of a Glasgow-bound aircraft was left dazzled by a laser pen shone from close to a police station, it has been revealed. The FlyBe flight was targeted around 8.15pm on Sunday evening while on approach to Glasgow Airport. 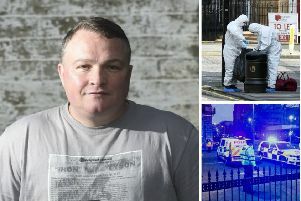 According to the Scottish Sun, the pilot reported the incident to police, informing them that the beam was pointed at the plane from close to Baird Street police station in Royston. Police Scotland have launched a probe into the incident. It is not known how many passengers were on board the aircraft at the time. British Airline Pilots Association’s general secretary Jim McAuslan said: “Aircraft are attacked with lasers at an alarming rate and using devices with ever-increasing strength. Earlier this month, an aircraft on approach to Edinburgh Airport was forced to take evasive action after being targeted by a laser pen.